AAA, the esteemed automobile club, calls the period between Memorial Day and Labor Day, the “100 Deadliest Days” of summer. It is fair to assume that distracted driving behaviors contributed a great deal to the creation of this term. In light of this, it seems appropriate to focus this post on one of the most prevalent human rationales for distracted driving, the ‘Multi-tasking Myth’. Mankind tends to believe that we are fully capable of doing many things simultaneously. We then allow this belief to justify our use of the cell phone—whether it be for texting, searching the web, or scrolling through social media—while driving. However, nothing could be further from the truth. Not even hands-free devices—like a car’s Bluetooth connection—are as safe as we may think, as the mental process of engaging in a conversation is dangerously distracting. Just as surprising is the fact that talking and listening demand different levels of work in the brain. Talking—producing information—requires more brain power than simply listening, and that’s where we get into trouble. One of the nation’s leading researchers on driver distraction, David Strayer, a professor of psychology at the University of Utah, explained that the brain does not focus on two things at once, but instead switches back and forth between tasks. This switching happens so quickly that we may think we’re multi-tasking, but actually we are task switching. As such, when the brain is focused on one task, like forming thoughts and language during a conversation, it may not be giving attention to the critical task of monitoring the road. If something unexpected happens while you’re talking, you’re not going to be able to respond to it quickly enough. The brain is so preoccupied with processing your speech that it cannot process what is in your visual field, causing ‘inattention blindness.’ A red traffic light or bicyclist may be right in front of you, but you actually do not see it because your brain is so focused on the workload of talking. Cell phones and in-dash technology are not the only types of distractions causing this epidemic. Three categories of distraction sum up all the ways we can become impaired while driving: visual, manual, and cognitive. A visual distraction takes your eyes off the road; this includes looking at your phone to read a text, checking directions on your GPS, or even looking at your fellow passengers. Manual or mechanical distractions include interacting directly with a cellphone, car radio, or any other electronic device. As our family learned, a manual distraction also includes reaching for a napkin. My daughter Shreya was killed as a passenger in a car when the driver reached out for a napkin. A cell phone did not cause the accident, but a moment of distraction did. As such we are dedicated to ending all types, forms, and variances of distracted driving as described in my new book, One Split Second. 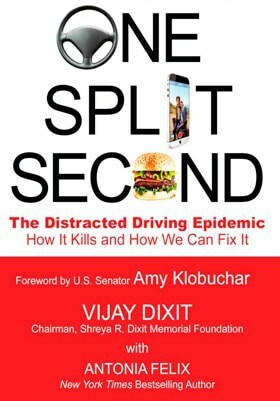 Featuring a forward by Senator Amy Klobuchar, One Split Second goes into further detail describing the great dangerous posed by distracted driving and expert perspectives on how to end this deadly epidemic. You can be a part of our movement by participating in our 9th annual Raksha Walk/Run (5k) for distraction-free driving on Saturday August 6th at Purgatory Creek Recreation Area. More information and details on how to register can be found on our website.